Immediately following the Renaissance, the Baroque era of the 17th and 18th century emerged from within the Catholic Church as a triumphant attempt to restore the papacy’s prestige following the tumultuous Protestant Reformation. In direct contrast to the more earth-centered art that was burgeoning at the seat of the Reformation in Germany and Belgium, the Baroque era in Italy was characterized by ornate details, exaggerated forms, and grandiose expressions in every genre from architecture to opera, all designed to attract worshippers back to the Church. Incredible works of genius, such as compositions by Vivaldi and Bach and masterpieces by Bernini, were born during this era, but the Baroque influence on architecture and interior design has indubitably been the most enduring. As you’ll see below, the divine details of the Baroque style remain attractive to this day and offer a thrilling juxtaposition to more modern elements. Read on to discover how to create the ultimate transitional living space with the help of Baroque precedents. 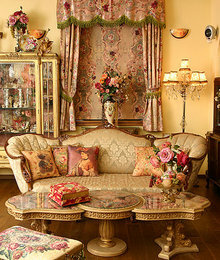 Baroque for the Traditionalist:Decor for decor’s sakeThis well-dressed living room showcases an enthusiast’s passion for baroque style. From the multi-layered draperies that cover an elaborate wallpaper panel “just because” to the ornate details in the sofa upholstery and carved coffee table, this room misses no opportunity to gussy up. Consider this a maximalist lesson in authentic baroque decorating. Decorating in LayersA true baroque artist would have seized absolutely every possible opportunity to add pattern and drama to a room, a painting, an opera, or a music score. 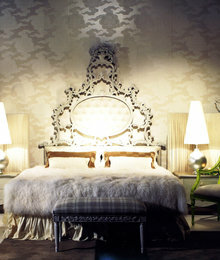 For this reason, the more baroque details you can layer into a room, the more classical your room will look. This room, for example, makes use of a mirror, carved furnishings, and heavily shirred window treatments that run in direct contrast to modern trends toward tailored minimalism. An Appreciation for CraftsmanshipBaroque styling requires the heart of a romantic and the eye of a master craftsman. 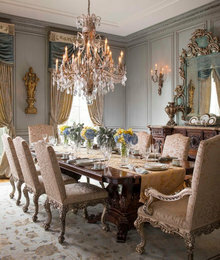 When baroque decor is described using adjectives like ornate, elaborate, and intricate, an appreciation of technical competence and skilled expertise is implicit. 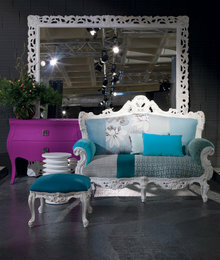 You won’t likely find many baroque patterns or carvings mass produced in a warehouse. Instead, fully embracing baroque style is an expression of value, an appraisal of fine, detailed craftsmanship as something virtuous and worth preserving. Aristocratic Status SignalThe window treatments layered with a sheer, a pair of decorative side panels topped with a valance and a cornice are telltale signs of baroque window dressing, but what really gives this room away as a baroque reproduction is the carved marble fireplace and tub surround. The luxury of marble would have appealed to baroque aristocracy in particular, who unabashedly decorated to communicate status. While admitting such a motivation is considered gauche today, builders traditionally have poured great effort and expense into adorning every last nook of high-status buildings like churches, palaces, and government buildings. 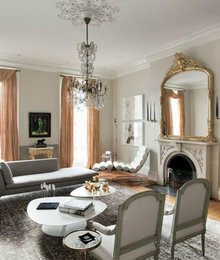 Baroque for the Transitionalist: Mixing and MatchingMixing the old with the new is a favorite trick of designers looking to add instant interest. Baroque pieces make for exhilarating counterpoints to today’s streamlined furniture designs because the two represent opposite poles of the style spectrum. 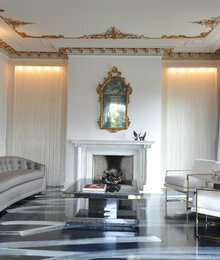 If you can coax an authentic 19th century ornate mirror into the same space as these current B&amp;B Italia sofas, you can probably drop in furnishings from every era in between. Unexpected Color SchemeWhether this entry table is formally baroque, or from the Renaissance period that immediately preceded it, its placement among so many browns and earth tones is more consistent with the way Protestant reformists were using color than the Italian Catholics, interested as they were in more earth-centered art. Limiting the palette to white and brown allowed this designer to slip in a highly angular and modern accent chair to create a scene that transcends the history in which it is rooted. Creating Negative SpaceAs obviously updated as this floating vanity and trough sink are, the heavy gilding and baroque ceiling details ground the room firmly in the past. The baroque influences are especially clear in the mirror and in the ornately wrought legs of the cast iron tub. However, the liberation of so much blank, white space is what makes this bathroom a prime example of transitional design: In its heyday, this room would have been drenched in patterned fabric and wallpaper. 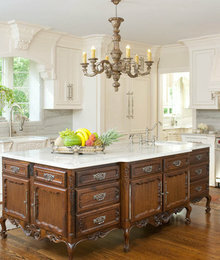 Baroque with a Touch of ModernitySometimes in a kitchen, updated appliances are the only modern reference needed. The designer could have specified an unadorned block of a kitchen island to be au courant, but it might have felt incongruous with the heavily detailed cabinetry. Instead, a suitably ornate kitchen island satisfies a modern demand for prep space while remaining faithful to the baroque theme. …Or Modernity with a Touch of BaroqueOn the other hand, this kitchen has only a few small baroque details to speak of– namely, the ceiling medallion and the ceiling trim. 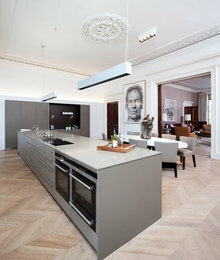 The updated take on parquet floors are another nod to history in what is foremost a contemporary kitchen. The tension between modern and ancient resolves as a dynamic design for a new age. Whitewash ItAnother way to use baroque details transitionally in the context of today’s trends is to preserve the ones you’re fortunate enough to have and paint them in a uniform coat of white. That way, you’re preserving the level of detail and the historical reference, but you’re deviating from the heavy patterns and gilding common to that era. Historical Shell, Modern NucleusThe Victorian style popular during the 1800’s was itself was a revival of multiple earlier genre, including Queen Anne baroque and Italianate. If you live in a Victorian possessed of ornate detailing like the kind in this photo, you might employ designer Janet Palk’s strategy of keeping the shell of the room fairly traditional, save for the modern artwork, and go more streamlined and modern for the furnishings. Reupholster It!Finally, one of the most popular ways to incorporate baroque– or any overtly historical style– into your home is to simply recover a thrift-store antique in a punchy new fabric. Whichever method you choose, rest assured that there’s no such thing as “outdated” in the hands of a skilled craftsperson or a talented designer with a knack for bridging history with the way we live today.